It makes me happy. Really happy. As soon as I hear the hiss of the cork, I begin to smile. As the liquid splashes into the beautiful, narrow flute and reaches up, up, up to the lip of the glass, my grin broadens. The bubbles rise from the bottom of the crystal and burst when they reach the top. I put my nose to the rim of the glass to inhale the aromas of the wine, and the bubbles rush into my nose. Bubbly. Sparkler. Mèthode Champenoise. Whatever others call it, I call it happiness…in a glass. Obviously the French region of Champagne is known for the most famous sparkling wines in the world. And rightfully so. These acidic wines aged on the lees and in the bottle, sometimes for years, are extra special to drink. Known for strong citrus and yeasty aromas, these wines make any occasion special, but shouldn’t be reserved only for special events. And they love their bubbles…all year round. Californians also make some amazing sparkling wines, many with deep influences from the French. Grab a glass of bubbly and sip away the day while enjoying a virtual written tour of Napa’s sparkling producers. Cheers! 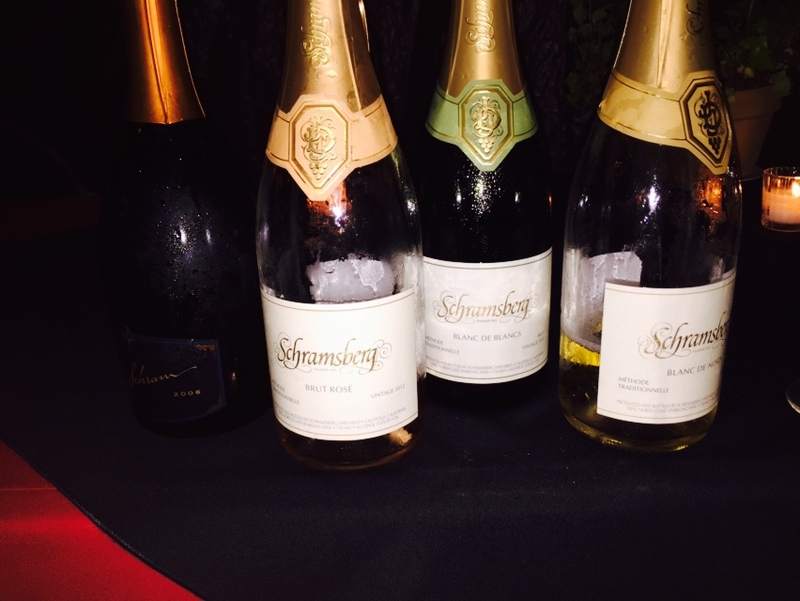 At the end of a long, winding, and narrow road, Schramsberg rests where it has for over one hundred years. 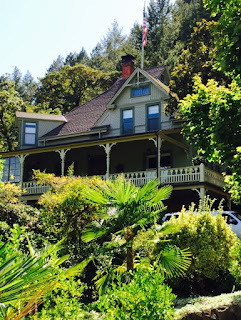 First possessed by Jacob and Annie Schram, the original caves and Victorian style house still watch over the property, today owned by the Davies family. Fifty years ago, Jack and Jamie Davies found a Napa property that enticed them. Over the years they lovingly restored that beautiful Victorian and produced an American sparkling wine worthy of any French palate. Today the winery is under the direction of Hugh Davies, Jack and Jamie’s youngest son, who was born the same year his parents purchased Schramsberg and who still lives in the property’s home with his family. 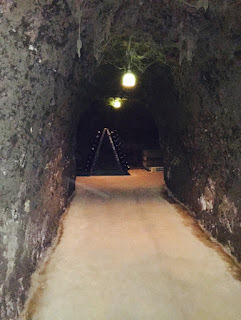 The Davies Family home and Schramsberg caves. Tours are quite limited due to the location of the winery, but the advanced reservation is so worth it. 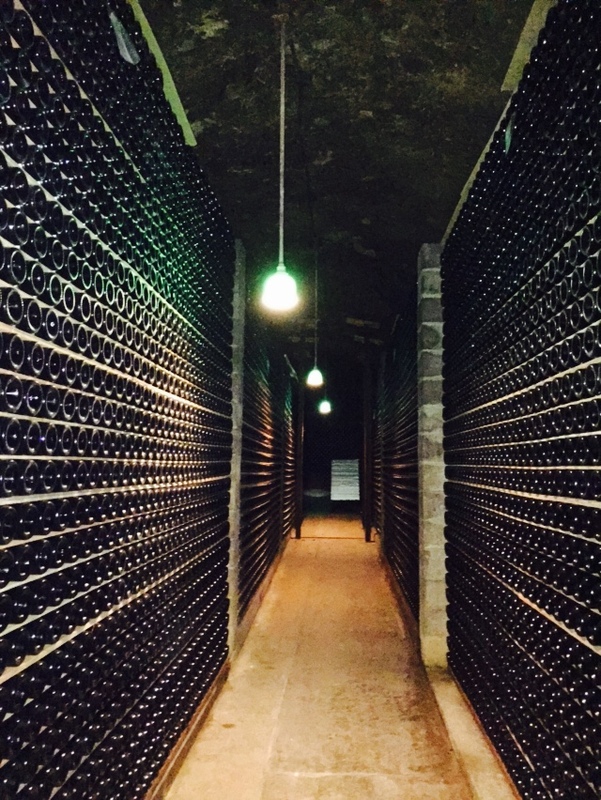 Tastings take place deep in the caves amid the literally millions of bottles of aging sparkling Schramsberg wine. 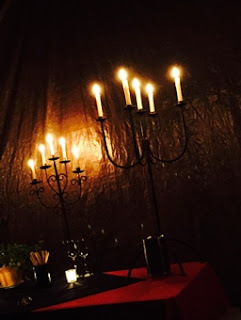 The atmosphere, the wine, the tour…all are superb. Tastings in the cave surrounding by millions of bottles of Schramsberg sparkling wines. Querencia—A brut rosé with robust berry and tangy citrus flavors, this is a beautiful and supple wine that would pair with many flavorful foods, yet it is truly worthy of sipping on its own. It is also an absolutely beautiful hue of pink with the tiniest of bubbles. The proceeds from the sale of Querencia go to the Jack Davies Fund for the preservation of ag reserve land in Napa. 2012 Schramsberg Brut Rosé—Another beautiful shade of baby pink, this refreshing sparkler is lighter than Querencia in color and intensity. However, it is wonderfully dry and acidic with an intense complexity from its time on the lees and in the bottle. 2006 J. Schram—Truly a special and spectacular wine, J Schram is made primarily of chardonnay. This lends to a rich wine with both citrus and tropical fruits on the nose and palate. Aged in bottle for nearly seven years, it is like silk in the mouth. An absolutely exceptional treat. Happiness waiting to be poured in a glass. 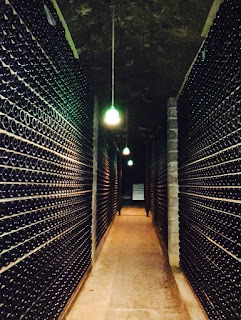 In the late 1970s, well-known Champagne producer G.H. Mumm sent his winemaker Guy Devaux to Napa to search for the perfect area to produce methode traditionnelle wines in the United States. Devaux found land and by 1983 was making wine under the label Domaine Mumm. A tasting room facility and underground cellar were built before Domaine Mumm changed its name to Mumm Napa. Set in the middle of a beautiful green space, Mumm has grown into a unique place to visit with its natural beauty overlooking grape vines and its art gallery featuring Ansel Adams’ work (among others). Beautiful grounds on all sides of Mumm Napa. Whether sitting on the picturesque outdoor patio, resting in the classy indoor salon, or strolling through the art, Mumm produces a wine for everyone. Brut Prestige—A wine good enough for the San Francisco Giants after winning the World Series is definitely good enough for others! This sparkler is reminiscent of brioche bread while being light, zippy, and refreshing. Obviously great for celebrations, but also a perfect option for the cocktail hour or with light appetizers. Brut Reserve Rosé—Almost-salmon color, the denser pigment in the glass shows its denser flavor in the mouth. Strawberry jam and orange marmalade on the first attack lead to a crisp finish. Would pair nicely with flavorful cheeses and other savory foods. I paired it with a BLT with great success. 2007 DVX—Mumm’s tete de cuvèe, this is an incredibly rich and creamy sparkling wine. Golden apple and roasted almonds on the palate were the result of part of the wine fermenting in oak. Additionally, spending over six years in the bottle adds to the lusciousness of the final product. A special wine for any special occasion. One gorgeous flight of sparkling. The first French producer to look to Napa to make traditional method wines, Domaine Chandon is the baby of Moet & Chandon. In the early 1970s, Moet & Chandon began searching for what it considered quality vineyard land to grow the customary sparkling grapes: chardonnay, pinot noir, and pinot munier. By 1976, Chandon’s Napa wines were released. Today, Chandon has many spectacular wines, but some of the most special options are the single vineyard varietals. Next, a tasting room worthy of these wines was built. The Napa tasting room has an almost-Parisian vibe with a hip, modern place to pour numerous sparkling and still options. The outdoor terrace remains the perfect place to taste or enjoy a full glass of sparkling with the cheese and charcuterie plate. Don't miss the cheese and charcuterie. California Rosé—Mostly chardonnay with a small amount of pinot noir, this wine would serve as the perfect everyday sipper. Light in color and body, this bubbly has strawberry and watermelon on both the nose and palate. There is great acid throughout with a refreshing finish at the end. Reserve Pinot Noir Rosé—Produced from Sonoma County grapes, this selection has more reserve wine added and is aged longer in bottle, creating a richer wine in body, color, and complexity. The deeper flavor starts with red fruits on the palate adding hints of floral and spice. Pair with many seafood entrees. 2009 Vintage Mt. Veeder Brut—Being grown from higher-elevation, Mt. Veeder fruit lends this wine very unique characteristics. It is delicate while being rich, light while being creamy. Lemon pie from the first attack to the final finish joins the baked sweet bread on the nose and palate. Worthy of drinking for any special occasion or cellaring for several years. Absolutely gorgeous in every single way, Domaine Carneros is located in southern Napa, in the Carneros region for which the winery is named. Another Champagne family investing in the Napa region of the United States, the Taittingers knew that the cooler Carneros area would be a textbook California climate for sparkling grapes. Grown and produced with sustainable practices, all near the tasting room and production facility, Domaine Carneros takes pride in its techniques and wines. Very rightfully so, Domaine Carneros also takes great pride in its unequivocally stunning chateau where production and tastings take place. Inspired by Taittinger’s Château de la Marquetterie in Champagne, France, the estate can be seen from all directions, whether coming from the Napa County side or the Sonoma County side. Stunning views from every direction. The driveway and gardens welcome all up to the terrace where wine lovers can sit outside overlooking the striking vineyards all around. Cheese and charcuterie plates are served both indoor and out, and for a really special sparkling experience, order any of the three caviar options (which I’ve heard is complimentary for ten-year wine club members—nice perk!). Blanc de Noir—White from black, the blanc de noir from the dark sparkling grape of pinot noir is a quality example of this style of bubbly. Light, crisp, and refreshing, the bread dough and white fruit explode from the glass. Pair with light bites and a cocktail hour. 2011 Brut Rose—Extended contact with the skin leaves this burnt salmon color in the glass, an absolutely stunning shade. Complex with strawberry overriding the flavors on the palate, yet delicate bubbles lead to the absolute dryness on the finish. Another striking example of my favorite sparkling style: rosé! 2007 Le Rève—Domaine Carneros’ tete de cuvèe, the 2007 was a great growing year which produced an even better sparkler. Over five years on the lees created a rich and creamy mouthfeel with baked sweet bread and overripe pear ending in a zippy acidic finish. Pair with seafood or rest it in your cellar for years to come. Bubbles…they make me happy…very happy. From the time the bottle opens, I begin to get excited. Each stop for sparkling in Napa made me beam. These four producers bottle joy; they bottle delight. Smiles float with the bubbles out of the bottle to the faces of those about to consume the happiest beverage of all…Napa’s French-inspired sparkling wines.